Between them, the couples have been married for 256 years. Do you want to know the secret to a long-lasting marriage? 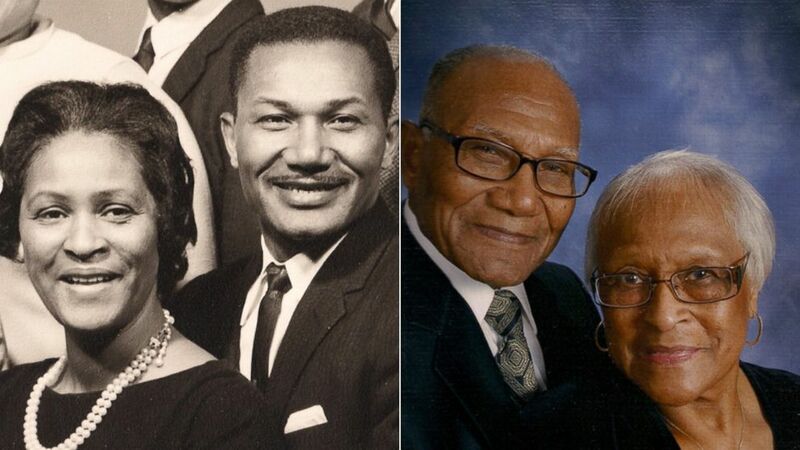 The reality is that no one really knows, but four couples who have all been married for more than 50 years told ABC News exactly what has kept them together over the decades. From World War II to great-grandchildren, these couples have endured the true tests of time thanks to an enduring love and communication. The Wallers met when they were teenagers. "We lived on the same street [in Chattanooga, Tennessee]," Macie Waller, 93, told ABC News. Sammy explained that he had borrowed a bike from Macie's cousin, and when he returned it, he spotted Macie. "I fell in love with her, actually, at first sight," he gushed. Before Sam, 97, as Macie calls him, was drafted into the Army to fight in World War II, the two wed Dec. 31, 1942, at the local courthouse. They eventually moved to Lancaster, New York, and now have six children, 11 grandchildren and 19 great-grandchildren. (Courtesy of Sammy and Macie Waller) Sammy and Macie Waller of Lancaster, New York have been married for 75 years. What's the secret to your marriage? Macie: "I don’t really know if there’s any secrets. We just respect each other and we love each other. We’re best friends." Sammy: "We don't do a lot of arguing. We try to get along most of the time and we got along pretty good. We do things together. We go to the movies -- we don't like the movies anymore -- but we just got along. I didn't go to the bar and leave her home and she didn't go to places and leave me home. We just hung together. I'm still hanging. How do you resolve conflict the best? Macie: "We just talk it over and try to straighten it out." Sammy: "I just normally shut up. I don't say a word." If there was one thing you wish you knew before marriage, what would it be? Macie: "If there was one thing I wish I knew, it would be to understand the sincerity of marriage. It's important to remember the vows you said when you got married ... and go back to them. This is the person that you said you loved. I didn't realize that as much when I got married, but through the years that can help carry you through." Sammy: "I never gave it a thought, getting married. There was a war going on and I was what, 21, 22, and I just knew that I was going to get drafted and I wanted to marry her before I left. I figured she might be married before I got back and I didn't want that to happen." What’s your advice to younger couples, married or not? Macie: "Think about the vows that they've made. And don't get angry or upset about something and say, 'I don't want to be in this,' because that's not what you promised. And always give respect to each other." Sammy: "Don't get into. .. big arguments. We never had a lot of big arguments and if we did have an argument, I just shut up. She can't argue by herself. We also had kids at home and if we had a little argument, we wouldn't ever let them hear us. I just loved her. The Hoffmans met while vacationing, separately, in a resort area in the Catskills, New York. "They put me in a room with five other men," Frank, 94, then an Army physician, recalled to ABC News. "I met my wife as she was walking out of the dining room [of the resort], and we all stood up and tried to pick a date." The only problem was Frank's friend picked Thelma, 91. "But I had a car and he didn't ... so we'd double-date and after a while, we switched it," Frank said. "She's my very smart angel!" 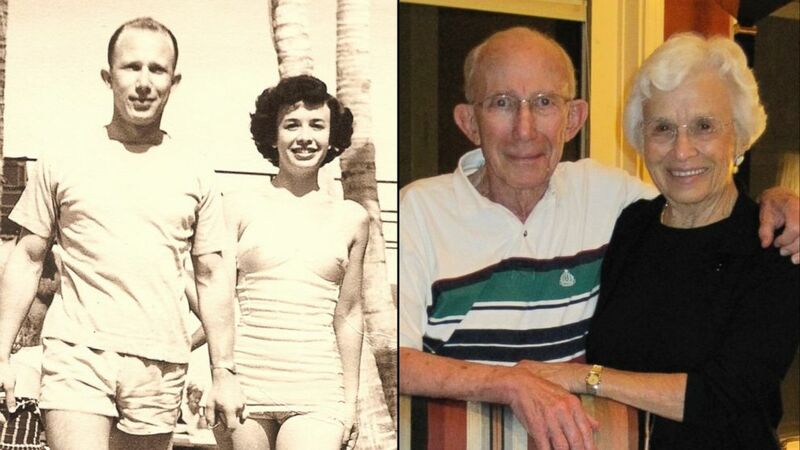 The two dated for more than a year before tying the knot June 12, 1949. The couple eventually settled in Savannah, Georgia, having two children and two grandchildren. (Courtesy of Frank and Thelma Hoffman) Frank and Thelma Hoffman, of Savannah, Georgia, have been married for 67 years. Thelma: "Loving one another and a lot of patience, and knowing what's important in life." Frank: "Love and a wonderful companionship. That's the great secret. We like to do most of the same things ... like go on cruises, go to the movies, go to concerts and socialize with friends." Thelma: "He doesn't argue. He doesn't fight. It's very difficult to make a point when you're doing the arguing; he just will not argue." Frank: "Easy! She wins! ... But we work it out and we get along. We go forward. We're both understanding and can appreciate each point of view, and we try to correct those problems. It's discussed and dropped." Thelma: "I don't know. I really don't know." Frank: "Do well in my medical career [as an ear, nose and throat physician]." Thelma: "Oh, dear,” she said, laughing. “Make sure -- besides loving one another -- that you are compatible and you’re willing to give and take." Frank: "Love one another and create a companionship. Your relationship should be one that you like to do the same things or you think about doing the same things." The Wilsons met in seventh-grade. "We haven't had any other boyfriend or girlfriend," James, 88, boasted to ABC News. His wife Virginia, 88, added that the two "courted all the way through high school until [James] went away to college." The two wed in 1954 after they had both graduated from college. Settling in Orlando, Florida, they are parents to two daughters. 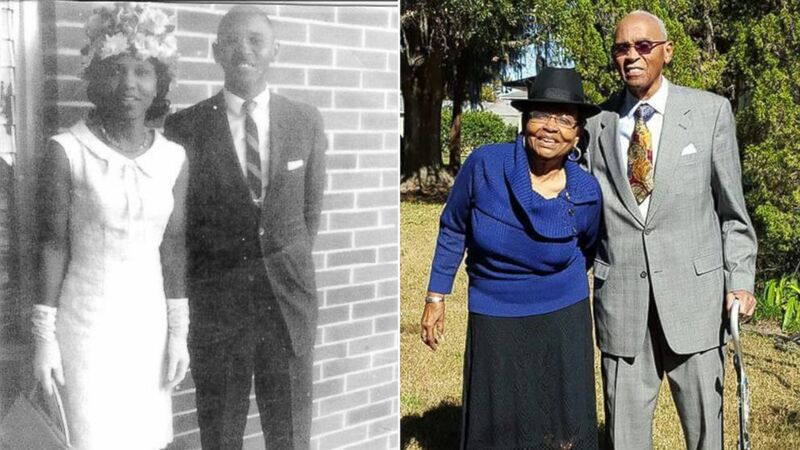 (Courtesy of James and Virginia Wilson) James and Virginia Wilson of Orlando, Florida, have been married for 63 years. Virginia: Communication. We try to communicate with each other. In our earlier years, he was a band director -- for 40 years -- which means that he was busy, busy, busy. And I was an elementary school teacher ... so we had to communicate often." James: "Well, we love each other. And we come from parents who were church-going folk and they taught us [about marriage] and we respected them so we had no problems. We lived the example they put forth for us." Virginia: "Talk it over. If you don't get it done today, talk about it the morning, talk about it in the afternoon." James: "We have so few conflicts, but we talk about it. She expresses her side and I express mine." Virginia: "Well, I had an example of my mom and dad. My dad was a country minister and they had six children so I came up in a family of six, so we always saw that." James: "I don't know, my love was so strong for her. She couldn't do anything wrong." Virginia: "Try to understand each other and try not to go to bed angry with each other." James: "Trust in the Lord and trust in each other. And try to do the right thing all the time. The wrong thing is the more attractive thing, so be careful." The Mattocks' met while attending Livingstone College in Salisbury, North Carolina. The two dated for "about a year," according to John, 76, before getting married June 26, 1965. John and Betty, 74, eventually settled in Silver Spring, Maryland, and have three kids and five grandchildren. 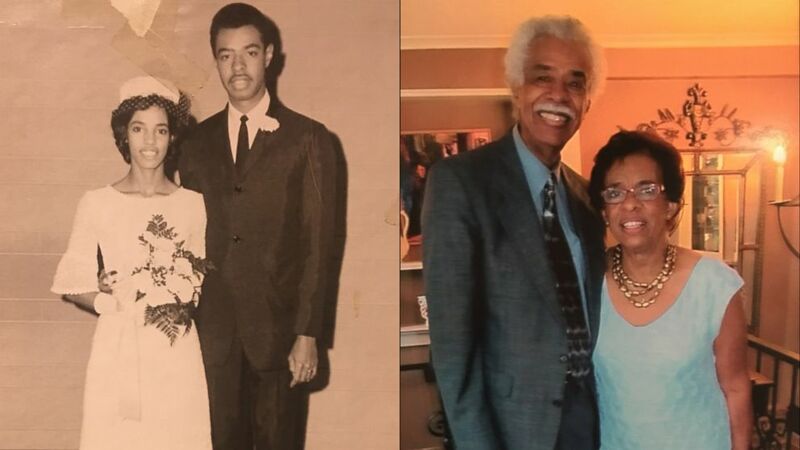 (Courtesy of John and Betty Mattocks) John and Betty Mattocks have been married for 51 years. Betty: "You have to have a sense of humor and not take things too seriously … also keep communication open." John: "I would say exactly the same thing." Betty: "You have to hear what the other person has to say and try to put yourself in their shoes and try to feel the way the other person is feeling." John: "I had to realize, like everybody else, there's an alternative point of view and I'm not always right." Betty: "When we got married, I moved from Lawrenceville, Virginia [where he was teaching], to Detroit, Michigan. I wish I had known a little bit more about that area. It was very, very cold and I must've gotten a cold every other month during the winter. I got really homesick that first year." John: "Over the years I realized marriage is definitely a partnership and definitely something that you have to work at in order to keep everybody happy. So we work well together." Betty: "Try to be aware of how the other person feels and try not to be all about yourself. And try not to stay angry over little things. In other words, 'Don’t sweat the small stuff.'" John: "I’ve learned over time that the best thing I can do to keep the peace is to pick the cars and the electronics and leave the rest to the wife. ... It’s been great. I would definitely would do it again."